Today’s GCL Miami Beach final will see the world’s top teams face off on the shoreline of Florida’s breathtaking beach, with the Monaco Aces leading the charge at this stage, being the only team to emerge with a double clear from Thursday’s first round GCL contest. With every point counting as teams look towards qualifying for the GC Prague Play Offs in December, team strengths and strategies are the day's hot topics. The full roster of 19 teams will be bidding for clean score sheets over this testing CSI5* track — but will riders opt to run the horses already proven and used to this unique atmosphere, or choose fresh legs in this crucial battle? Jumping in reverse order, overnight leaders Monaco Aces will be last to go and have only have two representatives at the Miami Beach GCL leg, but Jérome Guery (BEL) and Julien Epaillard (FRA). The duo were two of only three clears in the opening team round and they return to the ring at this magnificent venue on the same horses — the 12-year-old Belgian stallion Garfield de Tiji des Templiers and the Diamant de Semilly stallion Safari D Auge. The Miami Celtics — featuring an all-Irish line up for their home event— clearly have this team tussle at the forefront of their minds: both Denis Lynch and Shane Breen were among the 11 riders to made it through to the jump-off in yesterday’s big-money class, but both declined to jump, choosing instead to save Ipswich van de Wolfsakker and RMF Echo for today’s team showdown. The Scandinavian Vikings were the owners of the pivotal third clear in the first round of GCL Miami Beach, and Leopold van Asten will be looking to repeat the feat on the 11-year-old Chacco-Blue mare VDL Groep Miss Untouchable. The Dutchman and team-mate Christian Ahlmann (GER) are the only members of the squad here, but their form so far this week places them as top contenders. Just two penalties behind them, on six, sit the Prague Lions, another team with two on-form representatives. The Netherlands’ Gerco Schröder tipped a single rail on the talented Nabab de Reve stallion Glock’s London in the opening round and young team-mate Anna Kellnerova (CZE) put in a strong round on Classic, with both horses picking up a single time fault. Expect them both to press the gas pedal further down today. Team Doha Fursan Qatar are also sitting on six faults, with Qatari rider Bassem Mohammed hoping to capitalise on his cracking form so far this week and produce another strong round on his opening round team horse, Gunder. The New York Empire team have drafted in Scott Brash (GBR) on his prolific winner Ursula XII, who did not jump in the first round. Brash's top mare replaces Hello Shelby and join Georgina Bloomberg on the speedy grey Manodie II H.
Four teams carry eight faults forward from round one, divided only by time. The quickest of those, the London Knights, are leaving British rider Ben Maher’s Don Vito on the bench for today, swapping in his other horse Winning Good instead. Nicola Philippaerts (BEL) rides H&M Chilli Willi again, and the Belgian rider will be looking to avoid the time penalty and single rail he picked up in round one. Madrid in Motion (also on nine) make one substitution, with Dutchman Maikel van der Vleuten — a big winner in yesterday’s five-star individual class on Arera C — swapping out that mare for the fresh legs of 10-year-old Idi Utopia. 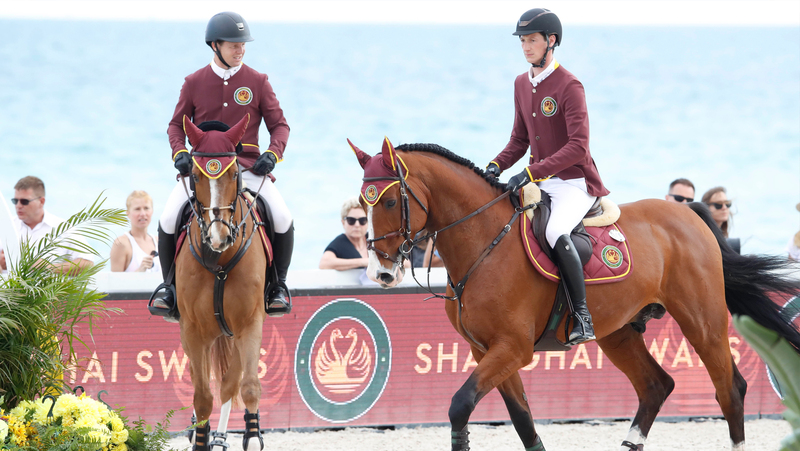 The Shanghai Swans have left both their first-round horses on the bench, instead calling up the 10-year-old Tobago Z for Germany’s Daniel Deusser and the 12-year-old Chacco-Blue stallion Chaqui Z for Ireland’s Shane Sweetnam. And Valkenswaard United’s two riders at Miami Beach, Alberto Zorzi (ITA) and Bertram Allen (IRE) will once again ride Contanga 3 and Gin Chin van het Lindenhof. Zorzi’s single time fault in the first round was combined with two toppled rails from Allen, who will be out to prove his horse can clear every question. Five teams are within a single rail of the four teams tied on points, so with faults evenly spread around Italian course designer Uliano Vezzani’s tracks, it’s all to play for this afternoon under the South Florida sunshine. Will fresh horses and riders give the teams an advantage? Or will the experienced players have the upper hand? And who will succumb to the pressure or the atmosphere? It’s all all cards face up in this afternoon’s GCL team competition and we can’t wait to find out how the drama will unfold. Entry for spectators is free — or simply stand on the beach and watch for one of the best views in the house. If you can’t make it down, then be sure to tune in at 14.00 local time to watch the action LIVE on GC TV and Facebook Live, with expert commentary and exclusive rider interviews.